This is my 4th yearly review. I’ve previously written reviews in 2013, 2015, and 2016. In these reviews, I explain my goals, how I am trying to achieve them and how things panned out in 2017. My major goal has never changed. It was to FIRE (Financial Independence, Retire Early). Here is how I described it last year. Our families dream life requires $80,000.00 a year. This includes travelling for at least 3 months every year. There are a heap of great retire early blogs and calculators, but in short, I am using the 25x rule (or the 4% withdrawal rate). All you need to do is take what you will spend each year and times it by 25, this will give you the number you need in investments to be financially secure for the rest of your life. So I need $2 million in investments (stocks, bonds, property, betting, startups, so on) to be able to stop working (if I choose). These investments should return 7% on average and I can withdraw 4% ($80,000.00) each year and the other 3% covers inflation. There’s a heap of complexities to it, but that is the general idea. My goal date to hit this number is in 10 years, when I turn 47. I already live what is my dream life, I travel whenever I want, I work on projects I find interesting and I get to spend time with my family. So even when I can “officially” retire, I doubt I will be doing anything different. This blog and my betting are just two revenue streams of many that I have created to try and reach my goal. My betting started with the goal to make $10,000 per year ($25/day), hence the name of the blog. That soon grew to a goal of $100,000 per year and has recently dropped back to $50,000 per year. The blog also generates income directly via affiliates, and indirectly via other services I run. Once I hit my goal, I wouldn’t pack up and move to some exotic location. My life wouldn’t be any different as I enjoy what I do. But being FIRE means you can choose to work or not work, travel or not travel and just a general freedom to do whatever makes you content. Let’s begin the review with the pure betting. In 2017 I bet a total of $2,137,810.00 and made $117,410.00 at a 5.49% ROI. This was almost half my 2016 turnover, and almost a quarter of my 2015 turnover. This was my first full year of following just Sportpunter models. As I mentioned last year, my goal was to follow the historically profitable models, reducing the amount I bet, but doubling my ROI and time saved. I achieved that goal with flying colours in 2017. If I can turnover $2mil each year and make 5%, I’ll be very happy. The year started with me following the NBA and NFL models. It was the NFL totals that did most of the damage and at one stage in early March, I was sitting on a $20,000 loss. But March also saw the start of the AFL and NRL season and with it came some amazing early profit. In the first 2 months of the season (Mar-Apr), the AFL and NRL made $119,000.00 profit. This pushed me from a $20,000 loss all the way up to a $120,000.00 profit. By April, the NBA regular season was over and I was only following the two Aussie sports. May saw the first losing month for both the NRL and AFL and I was back to an $80,000.00 profit. June was a fantastic month and pushed me to my yearly high of $146,000.00 profit. 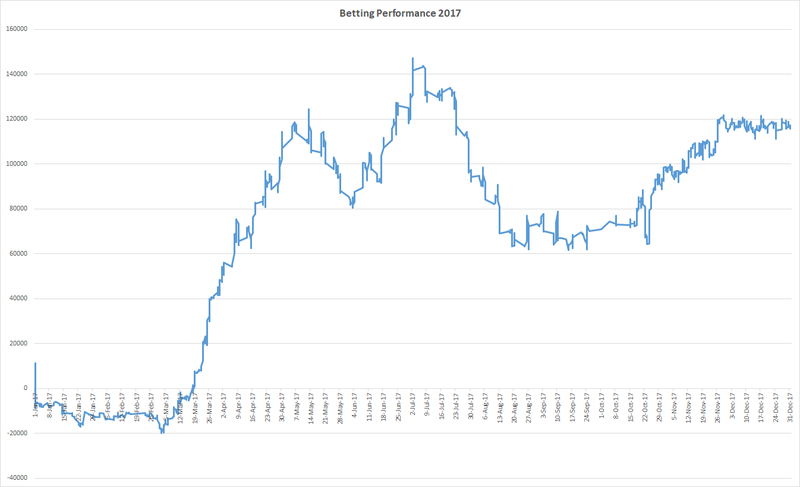 From July to the end of the AFL and NRL seasons in September, the models did not perform well, and I ended the footy year sitting just above $60,000.00 profit. The great thing about my current portfolio is that when the Australian sports end, the American sports begin (and vice versa), and October saw me moving back to the NBA and NFL models. All SP models seem to start extremely well before falling off and that was once again the case with the NBA and NFL. October and November profits saw me move back to $120,000.00 profit. The year ended with a tiny profit in December and an eventual total profit of $117,410.00 for 2017. We can now have a look at each individual model and how it performed. The AFL made $58,520.00, NRL $26,200.00, NBA $36,860.00, and the NFL lost $470.00. As I need to get bets on within seconds, every once in a blue moon I will make a mistake and these cost me $3,700.00 this year. In my never-ending quest to do as little as possible for the largest gain, I will need to have a think about the NBA H2H and NFL models going forward. The NFL takes no time at all and the SP model does not move the market, but if the returns are not there, it is easier to drop it. The NBA H2H does take a bit more time as it is daily and I think I will be dropping them in 2018. The turnover was spot on, but I outperformed my ROI figures. For 2018, my expected turnover and profit will stay the same. There are so many ways to make a profit with betting, and I’ll continue to try and add as much profit to my bottom line as possible. In 2017 I found a new way to still get FF points (no, I won’t be sharing it with anyone), I made about $6,000 in reward points (Ubet, Crown, so on), another $5,000 in promos and $21,000 from using Dailytrades. It all adds up and takes very little time, so I will continue to try and make these added extras in 2018. In 2016, my investment portfolio made an amazing 30% return (compared to 8% for the entire market). I did not buy or sell a single stock in 2017 and made a 15.32% return. While Aussie stocks are nowhere near the returns in the US market, they have done extremely well for me since I started investing in 2012 (17.3% return per year on average). But this will eventually come down to between 7-10% after many years. This portfolio won’t be touched for a very long time. I may add to it if there is a market crash, but it is now on autopilot. Dividends are reinvested and I pay almost zero attention to it. The exact sort of passive income I love. I’m a big fan of Bitcoin and plan to write about it more in 2017. I’m surprised more sportsbooks have yet to add it as a deposit method. Near the end of 2015 I decided to cash out some winnings from my 5dimes account, at the time, 1 BTC was worth about $300 USD. Over the course of 2016 the price rose all the way to $1,150USD before retreating and now sits at $900 USD per coin. I plan to keep my Bitcoins as an investment and see them heading back into the 4 figure range and onwards over the next 10 years. This is probably my highest risk investment. There is a chance they could go all the way to 0, or on the upside, each coin could be worth $10,000 (I’ve even seen estimates of $40,000). Bitcoin ended 2017 valued at $14,000 USD. The $10,000 figure I mentioned last year was what I felt it could be worth many many years in the future. At the start of 2017, I had $2,000 as my dream return for Bitcoin. I assumed it could (if I was extremely lucky), double in value each year over the next 5 years and be worth $30-$40k in 2021. I did not anticipate what happened in 2017. I could write 100 articles about Bitcoin, but in all of 2017 I only wrote one. I saw an exact replica of the tipster/gambling niche. We had “experts” everywhere, facebook/telegram groups popping up, twitter experts, youtube experts, and so on and so forth. Everyone is an expert now, and how can you argue with them, they have all made a heap of money. Anyone who put in anything in 2017 has made a huge profit. My warning to you is that we are all experts in a bull market. The valuations for 99% of alt coins are 10-100x what they would be if they were traditional startups. Eventually, they will be valued correctly. I’m still bullish on Bitcoin. So bullish that I have locked up the majority of my Bitcoins for the next 3 years. Even if I wanted to sell them I can’t. There are 3 layers of security I would have to get past, plus the coins are time-locked (meaning coins can’t be moved until a certain date). I did this because I believe the value of Bitcoin will rise and I know I will be tempted to sell along the way. I also know I am not smarter than the market and would sell and buy back at the wrong time. The best solution is to take all options away from myself. I’ve taken some profits, and have some fun money to play with in alts (which I fully expect to lose). But I also do not doubt that there will be some new companies that do really well over the long term. Bitcoin (on paper) has made me reach my major goal 10 years ahead of time. I did not have a plan in place to deal with this. I’ll be taking the first 6 months of 2018 to figure out what I do with my life now that I have reached my goal. Note: Bitcoin could crash and my paper gains could go to zero meaning I am back to where I was at the start of this year. Before the crypto market was a thing, you could still invest in startups without buying worthless tokens. You actually bought a stake in the company. I invested a fair bit many years ago via angelist. There were no returns this year as none of the companies I invested in was acquired or went public. A fair few of the companies I put money into went bust and shutdown (as the vast majority of startups will do). A number of them are doing well and went on to raise further funding. I won’t start to see real returns from these investments for at least another 5 years and likely much longer. That is just how long a startup takes to build a great product and figure out product-market fit (something many alt coin investors don’t seem to understand). One huge win this year was a company I invested in very early on winning the apple best app of 2017. Calm is a meditation app and has continued to innovate it’s product while grabbing more and more customers and making a solid profit. I had planned to really ramp up my affiliate marketing this year. After about two months I stopped bothering (see bitcoin above). I made about $24,000 from affiliates on this site in 2017. I’ll continue to do one-off blog posts when the opportunity arises. Dailyprofit.com.au didn’t grow at all in 2017. New customers still came via word of mouth, but the vast majority usually come via this blog. As I have barely written any posts this year, visitor numbers decreased and I saw the same percentage drop in new users of Dailyprofit. I’ve previously talked about how much the service makes, and I still make enough from the blog and Dailyprofit to cover my yearly spending. This year I also launched Dailytrades.com.au and it has performed amazingly well for almost everyone who has used it. As a business, it is just above breakeven. We make a small profit each month but it is not a cheap business to run. I personally made more from using the product than selling it to others. The majority of people have just 1 income stream (a job). I’ve always tried to build up as many different streams of income as possible. It really is the key to generating profits each year. Some years a few of those streams will result in a loss, but overall, the combined profits from all streams should result in a healthy profit. 2016 was a net losing year for me. After everything was tallied up, I was negative $28,620.00 for the year. 2017, on the other hand, was the most profitable year of my life. I can say with absolute certainty that I will never have a percentage gain like I did this year. But all I need now is a 100% gain in crypto in 2018 to beat out this years profits (something that at the start of 2017 would have made me sound like a crazy man). I have no idea what 2018 has install for me, the world seems to be getting crazier and crazier each year. I honestly can not give a prediction on what might happen in 2018 (but I’ll give it a go). Profitable sports bettors will find it more and more difficult to get a bet on, a min bet law is unlikely. I think stocks will do ok (5-8% gain), crypto markets will either crash 90% or go up 1,000% (I have no idea), the world will keep producing weird and wonderful events and some new technology or event will once again change how we view the world. 2017 was the year I was going to launch a few new products. While progress was made early in the year, my focus was needed elsewhere and I only half-heartedly worked on them when I had some spare time. My focus is still on other things at the moment and it may take some time before I can get back to finishing off these projects. I see no point in putting pressure on myself to release anything in 2018, but eventually, I will return to these projects and I’m sure they will do well. Financially this was easily the greatest year ever, personally, it was one of the worst. I won’t go into detail, but as a family, we have had to deal with a few things in 2017 and also going forward into 2018. I’m sure many readers have gone through similar health issues with family members. There isn’t much I can do apart from being positive and focus on what’s important and hope that the current medical science works. We had planned to travel to Asia and Europe in 2017, but those plans were put on hold. We did manage a week in Tasmania which was amazing. I have some tentative plans to head to the world cup in 2018, and do a month or so in Asia, so hopefully, that pans out. Since my son was born, something in me switched and made me focus more and more on making sure we were financially secure. I’ve neglected my health in that quest over the last 3 years. I’ve gone from a fairly healthy weight range of 82-84kg to a very unhealthy 95-100kg range. This year my weight didn’t move all that much, but it is 15 kilos more than it should be. I have said this for the past 3 years, but now I have no excuses not to put my health first. Financially we are going to be fine, so I have no need to be sitting in front of my computer 12 hours a day. The goal by Jan 1st, 2019 is to be 84 kilos and in the best possible shape of my life. I’ll slowly build up healthy routines throughout the year and make sure the first thing I do each morning is health related. 2017 was a very challenging year for me. I’m thankful that most of my income streams are streamlined now and do not require too much attention. That allowed me to spend my time where it was really needed. Heading into 2018 and beyond, I’ll have to shift my mindset from one of saving and working to one of spending and enjoying (A great problem to have). I hope your 2017 was fantastic and you have an even better 2018. Let me know how you went in the comments below. Hey Steve, Thanks for the write up I enjoy reading your Blog. Just touching on your Major Goal, Why the assumption that your investments need to return back to the long term average 7%? This is to conservative given your skill set. I spent years Sports betting and seeing the writing on the wall regarding Limiting and reduced turnover etc, invested time the last few years studying the stock market closer in an effort to get my capital I had made working harder. I was surprised just how simply it is outperform the market (for both professionals and individuals). In your example above you mentioned 2 million, If you were to get your net wealth to 2.5m You are by definition “a sophisticated investor” (A stupid rule, but a government definition) You would then have access to a huge array of investment vechiles that retail investors can’t access and that have a very high probability of significant Alpha. IMO with your background and skills learnt from gambling you could achieve your investment goal with a lot less than 2 Million and very little extra risk. Love the review! If you end up making it to the World Cup, would love to share a beer!! Great rundown Steve. Appreciate you putting all the numbers in for us to see, really is eye opening what can be made when you are smart about where you put your time. Had a reasonable year in 2017 myself, turned $17k into $36k or so (punting, arbing, value betting, promos etc). However after seeing a highwater mark of $42k around the end of September it´s been all downhill, roll sitting on about $31k now. How do you deal with these situations? And how do you know when to move on from a capper? Also would love to share a beer at the WC if you make it. Major congrats on the bitcoin run, and for the guts to actually back it when you did. Just make sure you can’t give all back!